Paris, La ville lumière, is famous for its Tour Eiffel, Avenue des Champs-Elysées and all its other tourist attractions. France is well know for its wines and good food, but it is also the major market in the world for Scotch whisky (in volume), therefore it is not surprising that France is hosting two whisky-live events a year, one in Lyon andone in Paris. 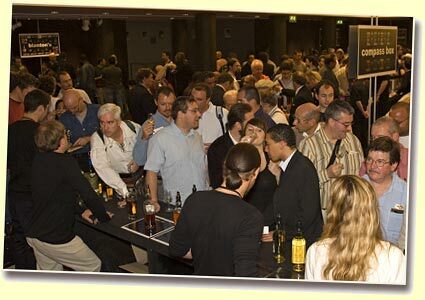 enthusiasts to try the latest products from almost all the companies involved in the whisky trade. And what about the whiskies? A gentle, soft, malty and quite simple whisky. Rating: 76 pts. This whisky was rather special & with a rather surprising flavour profile (spirity, rough, bitter, on vanilla & liquid soap). Amongst the 3 new BenRiachs available, this is the one I prefer; sweetness of the Port marrying very well with the heavy peaty spirit. A successful combination. Not less than 88 pts. This time, this is a combination of a lightly peated BenRiach, very fruity (on apricot and peach) with a moscatel (wine) finish. The wine influence is quite pleasant and the finish is slightly bitter and dry. Rating: 81 pts. The wine influence is so strong that you don’t know what type of beverage you are drinking. Not for me. Rating: 57 pts. A powerful, heavily peaty, quite complex & a serious challenger to the young Islay whiskies, with additional floral notes. Quite different from the Benromach 2000, less matured and more on grapes and burnt sugar. Rating: 77 pts. Caol Ila was rebuilt in 1974 and the Caol Ila from that period are very difficult to find. In spite of its 58.4%, it can be drunk straight quite easily. This Caol Ila is a rather gentle whisky but with a lot of mineral. A very peaty Caol Ila, very expressive & intense, that I really enjoyed. Would have scored even better if not for the winey influence. A very juicy and rich Glen Elgin, extremely pleasant, on sweet and tropical fruits, and reasonably priced. Rating: 90 pts. The sherry influence is very strong, with some rubber, but this Glenfarclas is otherwise very elegant and rather complex for its age. I don’t like much rubber notes, so the rating is 83 pts. A good, complex, and rather heavy and smoky (cigar box) Glenugie. Rating: 84 pts. Dry and tannic, this Laphroaig is rather disappointing and a pale copy of the former 30 YO. Probably too diluted with 40%. Rating: 73 pts. Fresh, floral, light, grassy and subtle, with a nice fruitiness. Hopefully, this whisky has not been ACEd, but the result is an ace. This is a nice and very mellow Lochside, heavier and less fruity than most other Lochside bottlings. Rating: 85 pts. This was my last dram of the event, an excellent and very old very sherried Macallan, with a lot of orange influence, relatively smoky and tannic. Reminded me of the old Macallan 30 YO sherry. Rating: 91 pts. A whisky with an excellent, but becoming in light, sweet and fragrant the mouth, with some bitter-dryness. It is better slightly diluted. Rating: 84 pts. Not surprised that the whisky magazine rated this Taketsuru the best blended malt of the world in 2007. The mouth feel is very pleasant, but even more so there is a superb balance between the flavours. Rating: 87 pts. A very nice and fruity Old Pulteney, sharing some similarities with some old and fruity Bowmore. With a few %ABV extra, would have scored better. Rating: 85 pts. The new Port Charlotte is partially matured in Madeira casks. The new PC6 is a bit more complex than the PC5, but also more docile. Rating: 82 pts. It is not one of the most peaty Port Ellen, but this is rather mellow, complex and with a long development in the mouth. If you like a complex Port Ellen, this one will appeal to you. Rating: 88 pts. The combination of heavy peat and an excellent sherry cask deliver an excellent whisky that any whisky aficionados should try. One of the best surprises in the Whisky-live in Paris, if not the best. Rating: 92 pts. In conclusion, it was a great event and I wish to thank La Maison du Whisky and Whisky-Magazine for the excellent organisation of the event and all the distilleries and companies present for granting us the permission to taste their excellent whiskies. If you do not know what to do in September next year, think about visiting the Paris Whisky-Live!